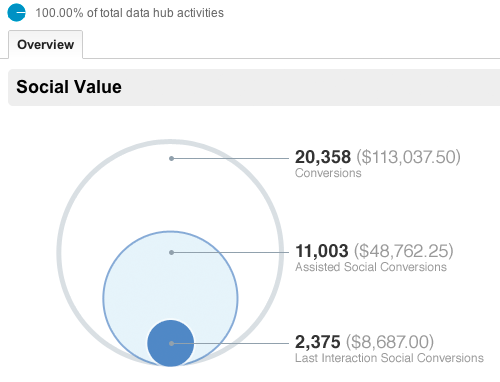 Last week Google announced their new Social Reports for Google Analytics. This is great news for multi-channel retailers. It’s always been hard to justify spending marketing budget, and more importantly, spending time, on social media. It has always been difficult to prove that it delivers ROI, and that it’s measurable. This is all beginning to change for social media. Last year Hitwise calculated that a ‘like’ on Facebook was worth 20 extra visits to your site over the course of the year. Now, with the new social reports that are being rolled out over the next couple of weeks on Google Analytics you will be able to see the value of social media as part of your customers’ buying cycle. Now we can see the value of social media the real challenge is finding out what content on your site is going to make your existing users share your pages on Facebook and Twitter. And what content on your Facebook and Twitter pages is going to engage people enough to ‘like’ your page and, most importantly, buy that great Map Jigsaw their friend just Tweeted about. Moneyspyder’s ecommerce platform is designed with measurability and adaptability in mind. We’re looking to share our expertise with people who want to be at the cutting edge of ecommerce. For more information on how we can help you build a great website or with ecommerce consulting email us on info@moneyspyder.co.uk or call 0207 492 1929.